Soon. Yay. Yet more confirmation that they’re coming soon. This doesn’t sound like just an announcement but availability as Samsung need not worry about new phones being announced but being on sale. It will take a while of course for Lumia to get the same traction to actually be a threat, just as both Samsung and iPhone have steadily built up a following over the years were not an immediate threat to the giant Nokia. There’s still plenty of room for everyone whilst the market grows. 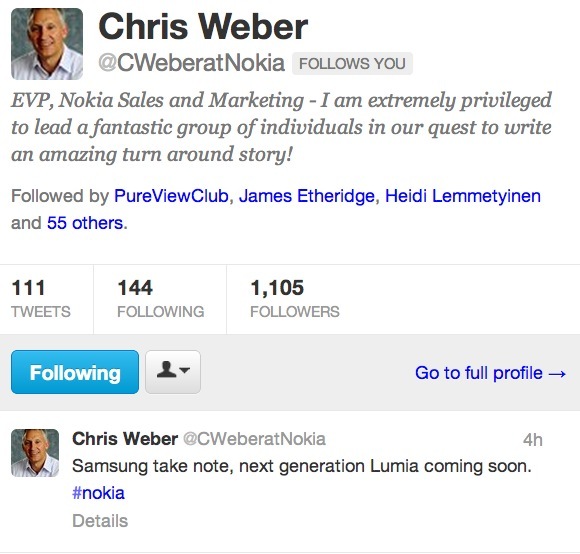 Hopefully this indicates that these new Lumias are also really good and something to take note of. Update: Noticed in the comments, lordstar mentions ‘Note’ as a possible product equivalent by Nokia to Samsung’s Galaxy Note. Lumia Phablet? Erm yes please. *throws next upgrade plans on lumia phablet*. ha. Maybe, but maybe not.